The Mars Express blog has been reactivated today, as a new series of Phobos flybys is already underway. Mars Express gets a series of 10 to 12 reasonably close flybys of Phobos once every five months, and is the only orbiter currently at Mars that can see the "far side" of Phobos. Mars Odyssey and Mars Reconnaissance Orbiter can only see Phobos' Mars-facing hemisphere, because those two orbit much closer to Mars than Phobos does. Phobos orbits Mars in a nearly circular, equatorial orbit. Mars Express orbits Mars in an elliptical, polar orbit with a close approach in the high northern latitudes. 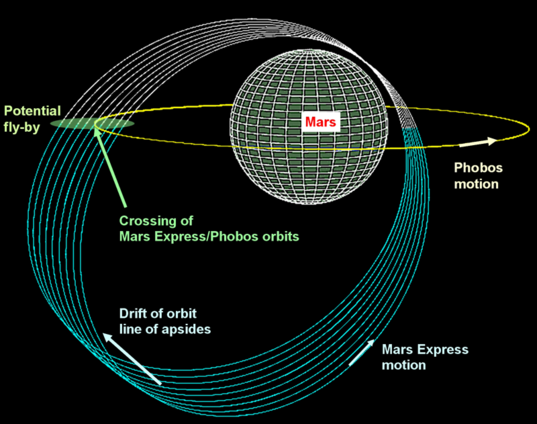 Mars Express' orbit drifts westward over time. Most of the time, Mars Express is far from Phobos, but about once every five months there is a series of 10 to 12 close encounters with the moon, during which Mars Express shifts from studying Mars to studying Phobos. Mars Express' High Resolution Stereo Camera (HRSC) caught Phobos over Mars' limb on its orbit 7982, on March 26, 2010. The waviness of Mars in the background is a by-product of the line-scanning nature of HRSC. This photo was captured during one of two Phobos flyby seasons that happened last year; the other was in August. The March photos are now available to everyone via ESA's Planetary Science Archive.